Ok. So many of you might have happened upon the exchange between me and my friend, Lauren, regarding coffee creamer after I wrote this innocuous post. PLEASE leave a comment below with your vote. And be honest. I won't judge you (much) for a dissenting sentiment. Coffeemate- fat free hazelnut. French vanilla in either brand is awful. International Delights creamer in ALL flavors is way better. That is all. Coffeemate! Not only does it taste better but the lid doesn't make creamer leak all over my fridge like ID's does. Coffee Mate - Peppermint Mocha's the best, but Fat-Free Hazelnut is my back up till Fall. ID is too syrupy. 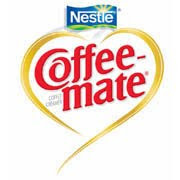 Coffee Mate by FAR !! Coffee mate is way, way better. Have you tried their Toffee Nut?